Weddings by VIP: FREE Social Media Portraits! 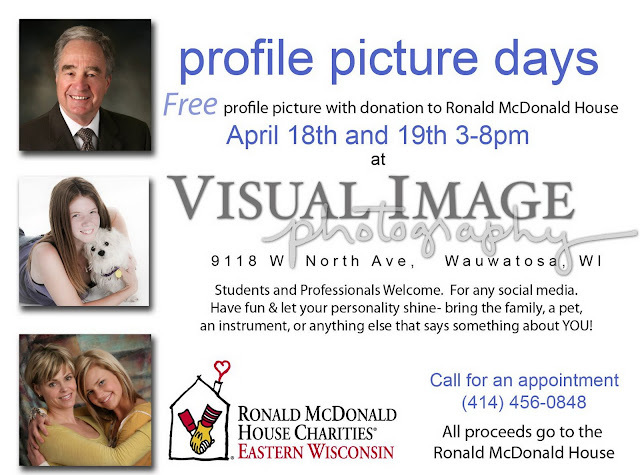 Visual Image Photography is working to raise money for the Ronald McDonald House Charities with a Social Media Session at our studio in Wauwatosa. Social media is such a big part of everyone's life. Would you like to have a professional photo to use on your Facebook or Linkedin page? Do you own a business and use social media to advertise? Wouldn't it be even better if you could have a professional portrait taken for free? Call our studio right now to make an appointment for your free Social Media portrait! Sessions will be available on Monday, April 18th or Tuesday, April 19th from 3:00 to 8:00pm. We can be reached at 414.456.0848. Steve LaMaster will be photographing individuals, couples, friends, students, kids and pets. What you pay is your choice! 100% of the proceeds will benefit the Ronald McDonald House Charities.